My mother (God love her, I loved her, etc. etc.) was *this* close to being a hoarder, except everything she kept had a logic to it, and nothing overflowed onto the floor or took over a room or left you with only a tiny path to walk. Nevertheless. She had lots of storage space in her home, and she made use of every inch of it. My mother was Martha Stewart before Martha was Martha Stewart. She sewed beautifully (she taught sewing at Singer in New York City), she knitted and crocheted, and whatever craft came down the pike, she did it: macrame, sandcasting, bargello, Ukranian Easter eggs, batik, tie dye, weaving baskets out of pine needles (seriously), decoupage -- you name it, she did it. And she did it beautifully. Our home was full of beautiful things she made, along with paintings, so many Christmas decorations, appliqued beach cover-ups . . . I could go on forever. She was creativity embodied. Our mom. She *loved* to laugh. 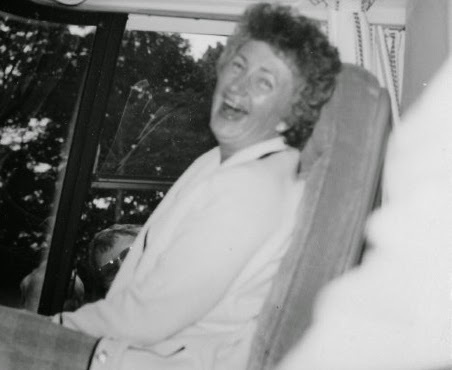 My mother was ill for some time before she succumbed to cancer, and her friend Bonnie would come over and say "Walli*, let's go through a drawer today," knowing that there were so many drawers, so many shelves and closets and boxes that someone would need to tackle when she was gone. And each space was packed to the gills. I know that Mom tried to deal with the stuff, but it was too hard at that point. I understand. beads, feathers, acrylic paints, little containers of sand (one of which was from her 1949 honeymoon in Bermuda), magazine clippings, 32 different colors of thread, clay and glaze (she had a kiln in the garage), crochet hooks of every conceivable size, pompons, glitter, bells, buttons, zippers of various colors and lengths, drawing paper, sewing patterns going back to the 50's, watercolor paints, rocks, ribbon . . .
. . . and a partridge in a pear tree. By the time I was through, there was something like 30+ large garbage bags full of the remains of my mother's incredibly creative life. In the end, it all got done. A minivan came from a senior center and squeezed everything in and took it away. I also went through her more personal stuff, makeup, body lotion, hair care products -- all the things we use and leave behind. I took one thing that was special to me, an empty purse atomizer of her perfume, Shalimar. It's in my top dresser drawer even today, and now and then -- not too often, because I don't want to use it all up -- I take it out and inhale the memory of my mother. She was one of a kind, and we kids all miss her every day. *her name was Waltraud. She went by Walli. We got mail addressed to Mr. Wally Ortman.